Syria: the labour movement must speak out! Cut the ultra-rich, not the poor! Unison will ballot, but when? New repression in Tunisia – support the workers' movement! Victimised Tube driver and union rep Eamonn Lynch has been reinstated to a station job with no loss of salary (he can reapply for his driver’s job after two years). He had won his Employment Tribunal. For Arwyn Thomas, the other victimised rep, London Underground bosses have committed to “legal discussions” with a view to resolving the case before his Employment Tribunal is due to announce its decision. Following a successful strike at Newcastle College in April, two more further education colleges could see industrial action as workers fight back against pay and job cuts. Up to 200 posts are under threat at South Tyneside College, where some lecturers also risk losing up to £11,000 from their salaries. In a poll in the local press, 85% of respondents said they supported the workers. Their ballot result is expected on Monday 16 May. It’s 11 days of strike action and counting for National Union of Teachers (NUT) members at Rawmarsh School in Rotherham, and they’re showing no sign of giving in. Teachers are fighting against job losses. 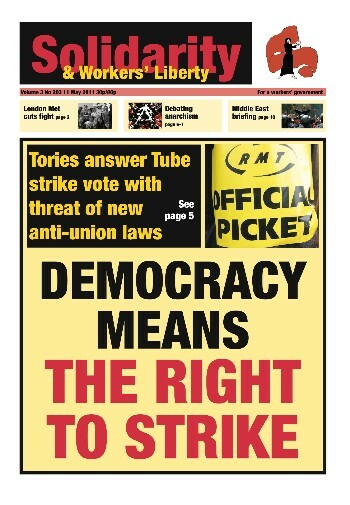 Strike action has already brought redundancies down from 25 to two. One of the jobs which remains under threat is that of the school’s NUT rep (surprise, surprise). NUT members weren’t about to give in and let management have their final revenge, so before Easter they voted to continue action until the rep’s job was safe. Grass Roots Left (GRL), which emerged from Jerry Hicks’ campaign in the Unite General Secretary election, has officially launched itself as an organisation. A meeting of around 40 activists on 7 May decided that their main focus initially would be organising within Unite but that they hoped to help build similar groupings within other unions too. A senior GMB union official was arrested on 4 May as police stepped up their attempts to break up protests by locked-out workers at the Saltend biofuels plant construction site. Workers have been demonstrating since 14 March, when their employer — Redhall Engineer Solutions — had its contract with Vivergo, the BP-led consortium building the plant, terminated. More than 300 Iraqi oil workers have staged a wildcat strike in Basra and demonstrated outside the headquarters of the state-owned Southern Oil Company. The walkout included workers from oil fields in Basra; from North and South Rumaila, Albirjisya, West of Qurna and Majnoon. Their slogans focused on corruption among company managers. They also demanded the levelling-up of their pay and conditions to the rates of workers employed by foreign oil companies. The divide between Qaddafi’s Libya in the west and Free Libya in the east continues even as Nato begins to intensify attacks against the heart of the regime in Tripoli. It is curiously reminiscent of Julien Gracq’s The Opposing Shore which described two divided empires across the Gulf of Sirte lasting for aeons. This is the fear on all sides — that regime intransigence and the inability of the rebellion to militarily secure the west could lead to some form of longer lasting stalemate. The intensification of Nato attacks signal that this is a very real fear. Our society is powered largely by burning fossil fuels. This is the equivalent to living on our savings. Fossil fuels — oil, coal and gas — were laid down over a period of a hundred or so million years and we are using about a million years’ worth every year. Even if there were not the risk of climate change, we should be looking for alternatives. Claude Choules, the last man alive to have fought in World War One — and in fact to have fought in both World Wars — died on 5 May at the age of 110. He lied about his age to join the British navy in 1916. He settled in Australia, and fought in World War Two as an officer in the Australian navy.